Milwaukee County vital records can be requested from the Milwaukee Register of Deeds by mail, with divorce records from the Clerk of Court. Records can also be requested from the Milwaukee and West Allis City Vital Records Offices. Historical records pre-1907 are incomplete and maintained by the Wisconsin Historical Society, dating to 1835 for births, 1851 for marriages, and 1872 for deaths, with a statewide index. Records after October 1907 are also available at the Wisconsin Department of Health Office of Vital Records in Madison, by mail, fax, or in person, for $20/copy. VitalChek handles online requests. 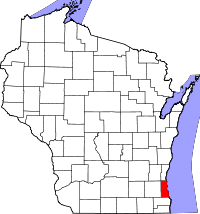 Milwaukee County was created in 1834 as a territorial county.